Some have referred to 2019 as the year of speed, and we agree—the need for speed is no longer something that businesses can ignore. Why? Slow-loading web pages cost you conversions, sales revenue, organic search rankings, and PPC ad quality score. With conversions and customers on the line—Leadpages is leading the charge for lightning-fast page load speeds. Spoiler alert: Lead pages load 2.4 seconds faster and have a performance score 30% higher*. Intuitively, you know that page speed matters, but do you know why it matters? And—more importantly—do you know if your current pages are sprightly & successful or sloth-like? We understand that dozens of factors go into deciding which landing page or website builder is best suited for your business. However, page speed has become a higher priority—particularly as search engines, like Google, begin to penalize slow-loading web pages in both organic search and pay-per-click arenas. Given the need for speed, Leadpages wanted to know: how do our page load speeds stack up against some of the “other guys” in the world of landing pages and web design? Or, in other words, in a flat-out sprint to the finish line, will our customers’ pages out-pace the competition? To answer our own question, we conducted a good, old-fashioned in-house digital experiment. The judging panel: Lighthouse, an open source audit tool among Google’s tools for web developers that’s built into Google Chrome. To access the Lighthouse audit tool, open an incognito window, right click over the web page you’d like to audit, select ‘audits’ from the dropdown menu and set the parameters for the test you want to run. Pro tip: We recommend running the Lighthouse audit in incognito mode so that any extensions installed on Chrome don’t interfere with the results of the audit. What about other tools to test your page speed? Google’s PageSpeed Insights tool is a frequently recommended tool that can give you a good picture of how quickly your site loads—but only if your site gets enough traffic that Google has data for the real-world load times. However, for a site that doesn’t get much web traffic, PageSpeed can really only provide some suggestions for how you might be able to optimize it. That score is not a true indication of how fast the site will load. Lighthouse, by comparison, is available for all sites and is recommended by PageSpeed as well. The results of the audit are output in an overall performance score (0-100, 100 being the best) as well as 6 key performance indicators that contribute to that overall score. Sample Lighthouse performance audit of a lead page on mobile, applied 3G network. We then created each of these 2 pages in 5 of the leading landing page builders on the market today (including Leadpages). Once the pages were built—fonts, images, and all—it was time to run them through Google’s Lighthouse audit tool to see how each platform performed. Because Lighthouse audit results can vary according to wifi connection, screen size, and computer type, we followed strict parameters and ran 4 different audits for each test, then took an average score for each page and platform. Want to know what we discovered? On both mobile and desktop devices, Leadpages has a higher avg. performance score than other leading landing page builders. On average, Lead pages load 2.4 seconds faster. On average, Lead pages have a speed index 40% faster. Each of these findings is based on a Google Lighthouse comparative audit of five leading landing page builders, rendering two distinct pages on both mobile and desktop on an applied fast 3G network. As we expected, the image-heavy long-form landing page was the test that truly revealed the ability of each platform. Think of it as a weightlifting exercise-most people can bench press 20 lbs, only the elite can handle 200..
After running the above audit a total of 80 times we took the average score for each platform to produce the data table below. Combined averages shown above are based on 8 Lighthouse audits for each platform and take into account page load speeds across both mobile and desktop. If you’re free-trialing landing page builders and website platforms, let Lighthouse lead the way! It’s a great way to make an educated buying decision. Want to recreate this test yourself? We welcome you to test our landing pages against other platforms. Simply download the image files we used, replicate and rebuild the layout, use the same fonts, and tell us what you find! Publishing your lead pages with a WordPress Plugin? Try publishing directly to your custom domain for best speed & performance. If you’re using the WordPress plugin to publish your pages, your page speed and performance may be inhibited by your WordPress installation. For best results, we recommend publishing directly to your custom domain, in which case your pages are served by Leadpages’ servers. P.S. You can even publish your lead pages to multiple custom domains (ideal for agencies and businesses with multiple websites)! So what’s behind our rapid-rendering lead pages? Two things: a lot of technical turbo power and a firm belief that small businesses deserve every advantage they can get. We talk a lot about how fast and easy it is to build landing pages at Leadpages, but that’s obviously not the only priority on our product roadmap. In fact, for the past several months behind the scenes, the Leadpages engineers have been turbo-charging our customers’ pages by tweaking a number of technical details. As you saw demonstrated in our in-house experiment, images, graphics, and multimedia files are one of the biggest culprits in keeping web pages from loading lickety-split. Why? A lot of it has to do with the fact that our modern devices now have higher pixel density and display resolutions, which makes for better-looking web pages, but image file size has also ballooned as a result. The higher the resolution, the heavier the image file—which burdens your page load speed. Go ahead and take a look at the background header (hero image) on this landing page. It’s a beauty, right? It’s also a big image file. Now, that may be appropriate for some larger monitors and devices, but the vast majority of laptops sold today have a screen resolution of 1366 x 768 pixels. With that in mind, click here to see the original image file size (3264 x 2448). And this is a relatively modest example. Far too often we see marketers uploading giganto-sized images that are displayed as 150 x 150 thumbnails on the page. Starting to sense that there’s a bit of overkill in the way these image files are traditionally rendered? To put it metaphorically, it’d be the equivalent of packing 2 checked bags for an overnight trip—it’s more than you need, and it’s going to slow you way down. This is also one of the reasons that the average page size has doubled in the past three years, according to MachMetrics. To keep your pages at the front of the pack, Leadpages engineers have fine-tuned our publishing and page serving processes and have prevented some of the technical challenges that would otherwise slow them down. These changes include dynamically resizing your images (on the fly) to perfectly fit the screen on which they’ll appear and serve the image resolution that ideally suits your visitor. But that’s just the tip of the iceberg and, as always, we’ll continue working on even more optimization opportunities in the near future. We believe that small business owners are some of the savviest, most agile marketers around. Why? Because they inherently move fast—they have to. You know that if you don’t work to improve your performance if you don’t a/b test to increase your conversion rates, if you don’t choose a landing page builder that’s got your back—chances are, your competitors will win. The digital arena is competitive—for all of us. We’re all competing for our audience’s limited attention span, competing in advertising auctions, competing on price—but now speed is one race you can confidently win. Page Load Speed Matters More than You think. Analysts measure load speed in the microseconds—but small businesses measure it in lost leads and traffic. In fact, the BBC has seen a loss of 10% of their users for every second of page load. Why? A lot of it has to do with competition and expectations. Simply put, today’s website users expect lightning fast—and they’re simply not willing to wait while your page lazily loads the images, graphics, and text that deliver your message. They’ll simply close out a tab and choose another page that shows up on time. In other words, they bounce. According to Google, approximately 53% of visitors bounce after three seconds. But a poor bounce rate is just the beginning. A high bounce rate is bad news for getting traffic to your site (because it sinks your SEO). Most marketers know by now that bounce rate (the percentage of visitors who land on a page and leave the site before taking any action) is a factor in overall visibility in organic search results. To put it simply: it’s a signal to Google that your site is of poor quality and delivers a sub-par user experience, which is a primary concern to the world’s biggest search engine. Sure—you could make the argument that a loyal, loving visitor would be willing to wait while your pixels align and your fonts fall into place, and you may be right. But what about a new prospect—a stranger to your site and a newcomer to your brand? They’re not sticking around, not a chance. But even if you’re not concerned with SEO, bounce rate is only the beginning of the problem. Sure, it can sink your site’s visibility in search engine results and cost you web traffic, but it can also seriously cut into your conversion rate. Slow-loading pages could be killing your conversions. Just imagine what that means for your digital marketing: you polish your page, launch an irresistible ad, and send people to a page that…wait for it…wait…a little longer…here it comes…nope, too slow—I’m gone. You spend painstaking time perfecting your landing page’s written content, page design, call to action, and you spend your hard-earned money to drive traffic to that page—can you imagine letting all of that effort evaporate as the result of a slow-loading page? 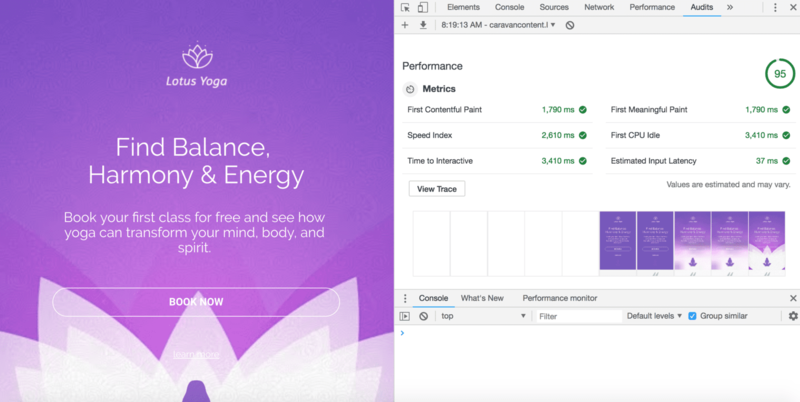 It’s not just about improving page performance and speed. It’s about improving the user experience on your landing page and website. In addition to costing you conversions (and the revenue that you’d otherwise earn from present and future customers), poor load speed could also easily drain your marketing budget—especially if you’re paying for a landing page builder and paying to send traffic to your pages. Not even the biggest brands can afford to spend money shuttling web traffic to a slow-moving, sluggish page, that frustrates them so much they flee. Speedier landing pages have a higher conversion rate, have higher traffic and engagement and stretch your advertising budget by earning you a better quality score on your PPC ad campaigns. But the good news is, that businesses who have improved their web page performance have seen some remarkable returns. Take Walmart for instance, Walmart saw up to a 2% increase in conversions for every 1 second of improvement in load time and a 1% increase in revenue for every 100ms improvement. That’s staggering. Like the call for mobile responsiveness, security, even GDPR compliance, there have long been rumblings about the need for lighting fast page speeds and experts expect the bar to continue to rise in the months and years ahead. Don’t believe us? Google it—no really, Google is getting more serious about page load speeds than ever before. In July 2018, Google came out with a “Speed Update,” setting new performance standards and doubling down on the importance of delivering fast-loading mobile landing pages. Fail to head the call and Google’s got some bad news for slow-loading sites. That’s a big signal to both small businesses and big brands to begin prioritizing page load speed along with persuasive art & outstanding copy. So whether you’re relying on paid or organic traffic to your landing pages, desktop or mobile, page speed has the potential to make or break your campaign. Take a look at the global statistics of mobile web traffic and you won’t be surprised to learn that that mobile page load speed is the item at the top of most marketer’s list. According to Think With Google, approximately 70% of mobile pages take nearly 7 seconds for the visual content above the fold to display on the screen, that’s the equivalent of 100 years in digital dog years (give or take). That’s not a problem you (or we) could ignore, especially considering that more than half of overall web traffic comes from a mobile device. Ready to win the landing page speed race? Whether you’re suffering from low-converting pages or want to ensure that your page performance continues to outpace the pack, there has never been a better time to inform yourself and empower your business with the tech it needs to truly compete. As we said, Google’s Lighthouse audit is an excellent indicator of how competitive your pages are, but it’s by no means the only way you can look behind the hood of the many many web development platforms on the market today. In the time it takes you to—oh, perhaps complete a 14-day free trial—you can gather the experience and information you need to know what a conversion-optimized, high-performance lead page can do for your business. As for today’s digital landscape and Google’s intent to get page load speed and user experience at the forefront of web development, we’ll be keeping an ear to updates and keeping you informed of what you need to know to make the most of your digital marketing. *Based on Google Lighthouse comparative audit of five leading landing page builders, rendering two distinct pages on both mobile and desktop on an applied fast 3G network. Start converting traffic from ads to action. What is a Lead Page? ©2019 Avenue 81 Inc. d/b/a Leadpages, All Rights Reserved.